"Anytime they’ve tried to bring her out, it winds up being a disaster." 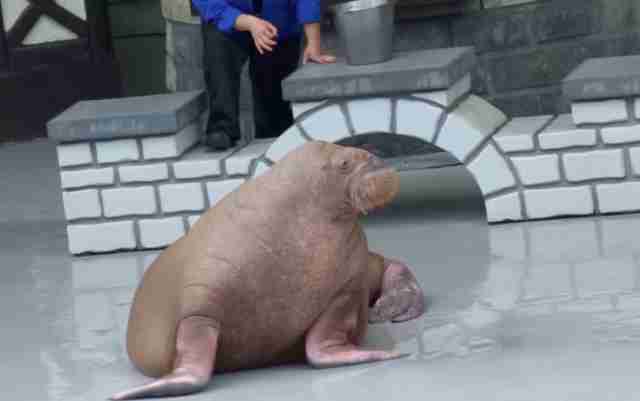 In a 2015 video, two walruses waddle onto a stage to perform in a show at Marineland, a controversial ocean park in Ontario, Canada. 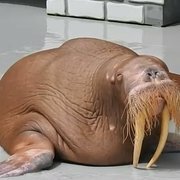 One of the walruses, a female named Buttercup, follows her trainer’s commands, wiggling her bottom and waving her flippers. After doing this, she’s rewarded with pieces of dead fish. 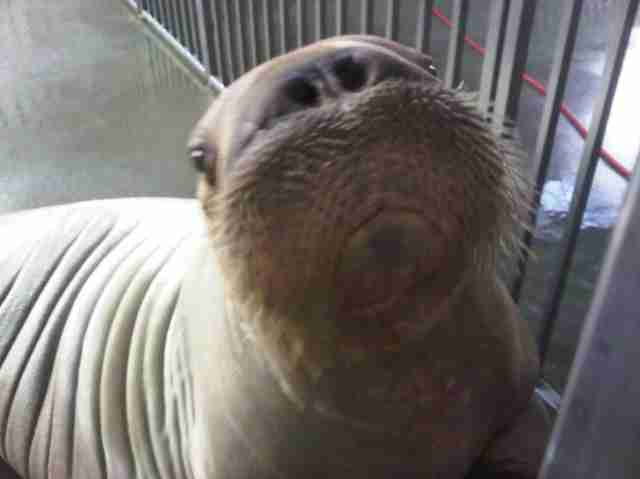 But the other walrus, a female named Smooshi, doesn’t cooperate at all. Instead of following her trainer’s commands, Smooshi shuffles across the stage, looking around with wide, red-rimmed eyes. She walks toward the pool and sticks her head in the water, as if she’s going for a swim. Then she seems to change her mind, and sniffs around a treasure chest on the side of the stage. To many people, Smooshi may just look untrained. But Phil Demers, a former Marineland trainer and current animal welfare advocate, believes he knows the truth — Smooshi is actually searching for him. 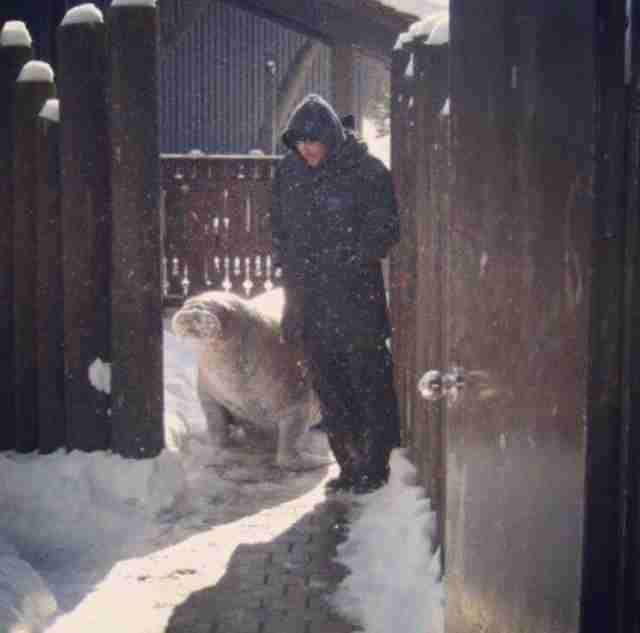 Demers spent 12 years working as a trainer at Marineland, and during this time he formed an unusual bond with Smooshi, who was imported from Russia when she was a calf. 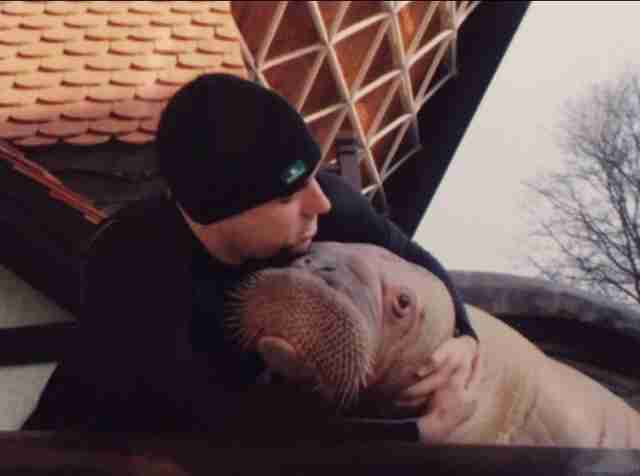 According to Demers, Smooshi imprinted on him when he was trying to calm her down during a stressful situation — a staff member was drawing blood from another frightened walrus, and Smooshi tried to intervene. Demers put his hand in front of Smooshi’s nostrils to try and calm her down, and the walrus suddenly focused all of her attention on Demers. Demers recalls Smooshi following him around the park — she’d ride in the back of his truck, accompany him to other animals’ enclosures and pools and even watch the dolphin shows in the stands with Demers. “While the dolphins are jumping and seals are waving in the aquarium, I’m in the stands with this walrus, and people are losing their minds, and we’re stealing the show, because they can’t believe that there’s a walrus here,” Demers said. 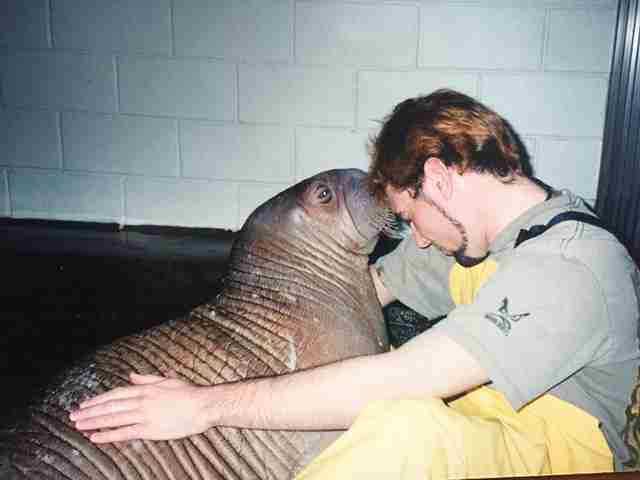 Smooshi’s attachment to Demers was so strong, she couldn’t cope when Demers went away to Europe for 10 days. When Demers returned, Smooshi got better, but Demers realized this was going to be a big problem. In fact, he didn’t think he’d ever be able to leave her. 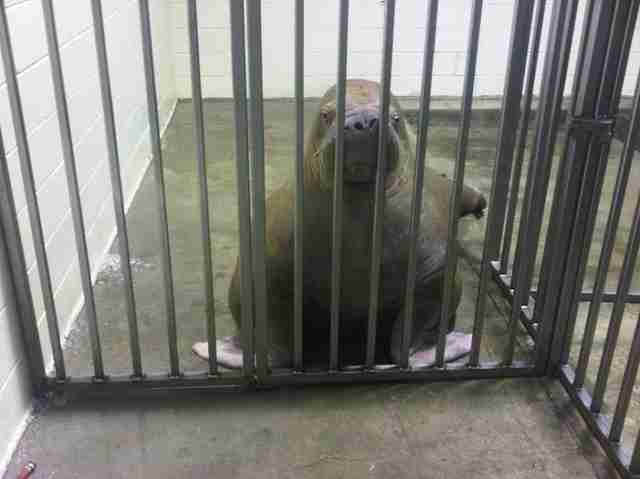 But the longer Demers stayed at Marineland, the more dismayed he became with the park’s mistreatment of animals. He witnessed animals get sick and die from swimming in contaminated water, and sea lions and walruses confined to waterless cages. Other staff members witnessed two male belugas kill a baby beluga when the calf was placed in the same pool as them. Whenever Demers approached the park’s management team to speak about these issues and make changes, nothing was done to improve the animals’ lives, according to Demers. Demers also became increasingly worried about Smooshi, who’d developed chronic regurgitation issues, a sign of captive stress, which caused her to lose a lot of weight. 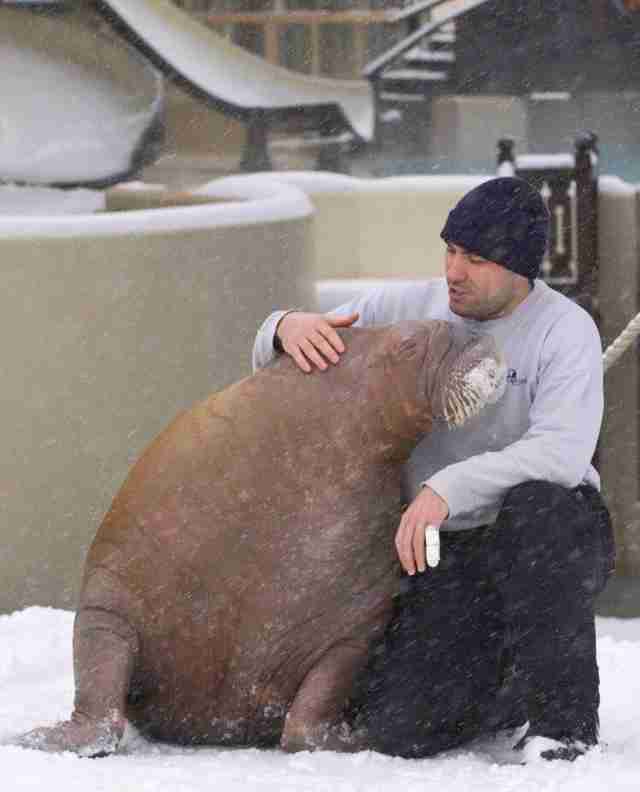 The first time Demers returned to the park after resigning, the staff didn’t let him see Smooshi. But the second time he visited, Demers did get to see her — and what he saw has haunted him ever since. 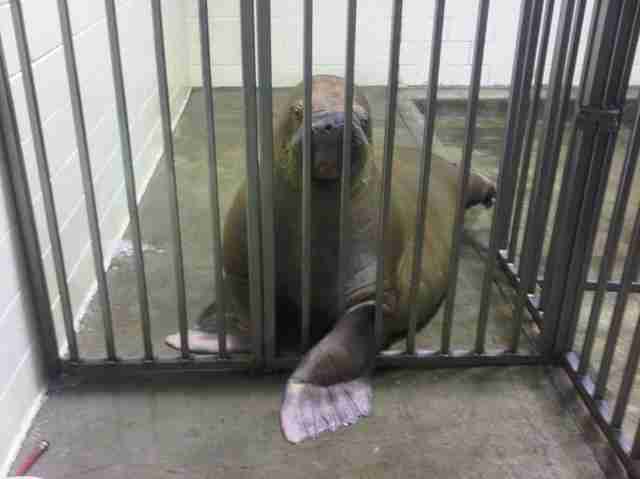 When Demers arrived at Smooshi’s pen, he found a very sick and underweight walrus. Demers coaxed Smooshi into eating some food and drinking some water, and the vet got some medication into her. 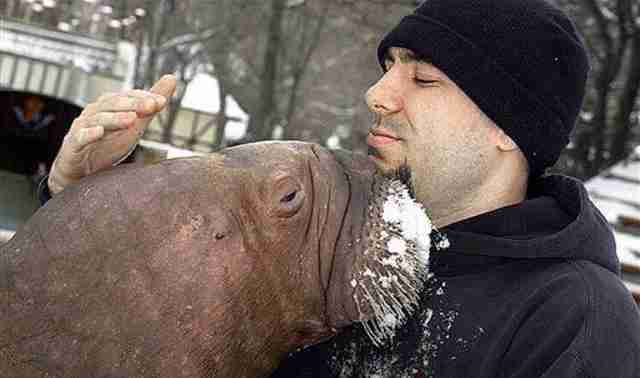 But Demers knew he had to do more to help Smooshi, as well as the other animals at Marineland. “I realized I don’t have the luxury not to speak about what’s going on there anymore … and Marineland has made their intentions very clear that they don’t intend on doing anything about it to help her [Smooshi],” Demers said. In August 2012, Demers spoke with the Toronto Star, where he and other former Marineland staff members exposed many of the park’s issues. Since the release of that article, Demers has continued to speak out against the park, where animals have continue to suffer and die each year. But speaking to the media came with huge costs — one of them being that Demers hasn’t been able to return to Marineland to visit Smooshi. In fact, the only way he’s been able to keep tabs on her is through the park’s occasional Facebook post or YouTube video, or a report from a visitor who saw Smooshi perform in a show. Smooshi is rarely used in the Marineland shows, according to Demers, mainly because she doesn’t cooperate with the trainers anymore. 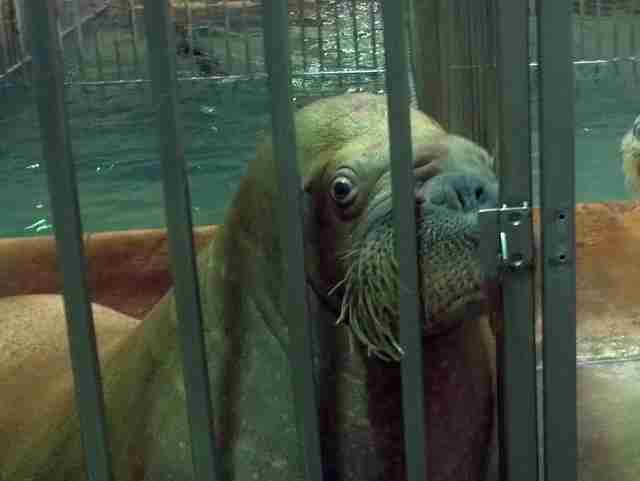 And when Smooshi isn’t participating in the odd show, she’s locked away in a hidden pen, and it’s virtually impossible for the public to see her, Demers said. While Demers has no real idea how Smooshi is faring today, he’s become even more concerned for her after Sonja, another female walrus, died this week. Demers isn’t the only one concerned about the park’s walruses. 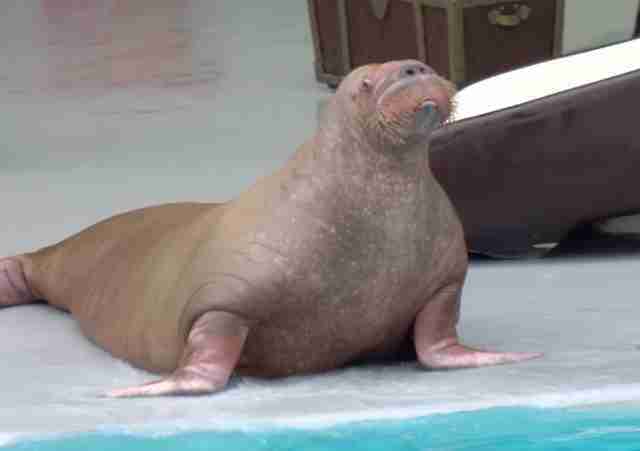 Last August, there was an international outcry after a video surfaced showing Zeus, a 14-year-old walrus who is so emaciated his hip bones and spine stick out, being forced to perform in a show. 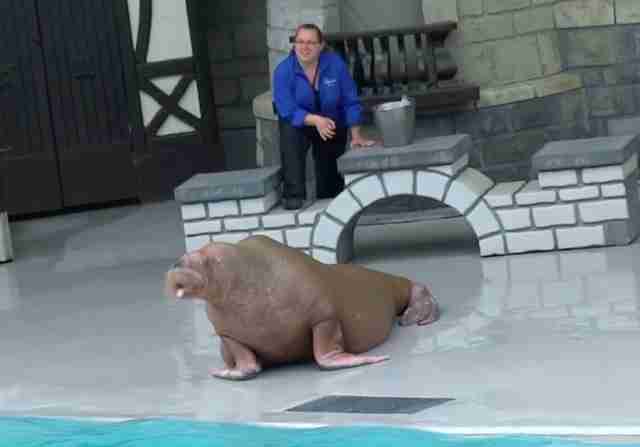 Like Smooshi, Demers says, Zeus has chronic regurgitation issues, yet he still performs for the public. Marineland, however, denies everything that Demers says about the park’s mistreatment of animals. “Smooshi, like all of our marine mammals, is provided with a high degree of care by our dedicated marine mammal team and in the real world where she lives, but it appears Mr. Demers does not; she is happy, healthy and continues to enjoy strong bonds with her trainers and care team,” Marineland added. Yet Demers isn’t certain that Smooshi is healthy and happy, and he’s not even confident that she’s alive. 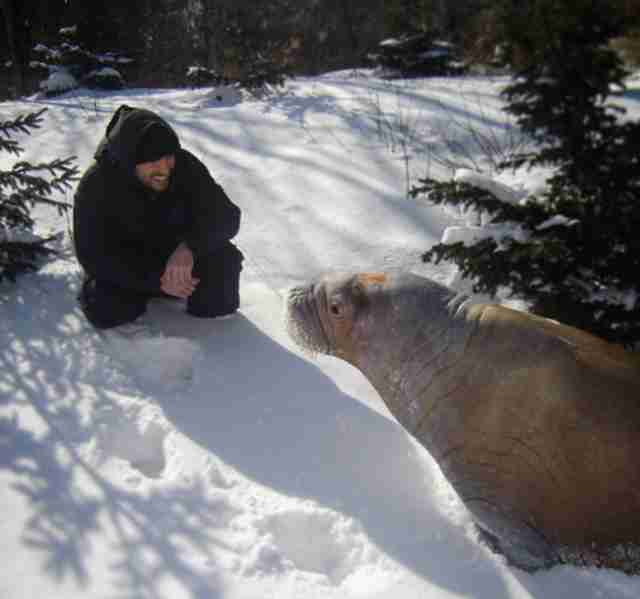 Marineland also claimed in a recent statement to have rescued Smooshi and the other walruses from Russia after the breakup of the Soviet Union, although Demers has a different spin on events. "They're now claiming to be a walrus rescue facility,” Demers said. “I've never heard such nonsense in my life. Such an absurd lie. They pay the Russians to capture babies." While it is too late to help Sonja, as well as the numerous other animals who have died at Marineland, Demers has vowed to keep fighting until the facility is closed down and the animals are rescued. “I'd like to see the animals rescued from Marineland and moved to sanctuaries where they can live the remainder of their lives with some semblance of dignity,” Demers said. 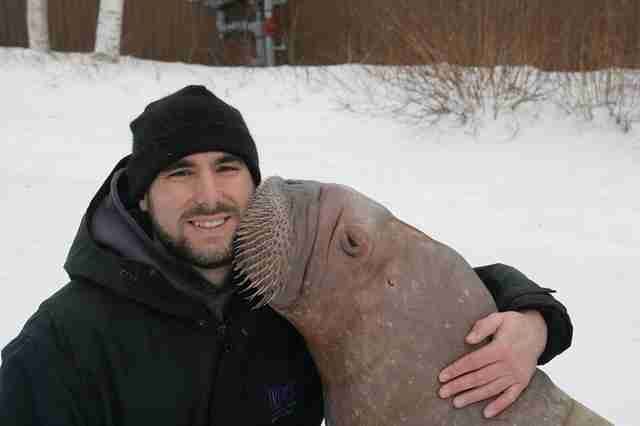 Demers also dreams of seeing Smooshi again — and when they do meet again, he imagines the best kind of reunion. To help the animals at Marineland, you can support Demers' court case against the park by making a donation.